In the 2011 census, the population of Sandgate was 4,626, 51.4% female and 48.6% male. 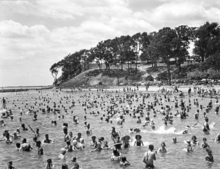 The median age of the Sandgate population was 43 years, 6 years above the Australian median. 77.8% of people living in Sandgate were born in Australia, compared to the national average of 69.8%; the next most common countries of birth were England 5.9%, New Zealand 3.7%, Scotland 0.8%, Ireland 0.6%, Philippines 0.5%. 92.1% of people spoke only English at home; the next most common languages were 0.5% German, 0.5% Japanese, 0.4% French, 0.3% Filipino, 0.3% Italian. Sandgate is situated on the coastline, along Bramble Bay. It is connected to the Queensland Rail City network. The western border of the suburb is marked by the Gateway Motorway. A large section to the west of the suburb is known as the Deagon Wetlands which is part of the North East Wetlands of Brisbane. The area was originally known as Cabbage Tree Creek (after the creek). The name Sandgate may have been inspired by Sandgate on the coast of county Kent, England by James Burnett, an early surveyor in the region. Sandgate in Kent had a military camp, Shorncliffe Camp, on top of the cliffs adjacent to it. Sandgate in Brisbane also has an adjacent suburb called Shorncliffe. It is recorded that the Turrbul people, who long inhabited the seashore, the creeks and lagoons, in what we know as the locality of Nudgee Beach to the Pine River, were a branch of the clan of the Yugarabul speaking people. This larger clan inhabited the area from North Brisbane and along the coastline of Nudgee, Sandgate to Caboolture. In their language the local Turrbal clan called their coastal land "Warra" – "an open sheet of water". This land we call Shorncliffe, Sandgate and Brighton. Their existence depended upon their knowledge of the seasons and their surroundings. Spears, nullas and boomerangs were used in hunting and woven nets for fishing. Land in Sandgate became available in 1853, allowing a small seaside settlement to develop. One of the first structures built at Sandgate was a Native Police barracks, from where officers such as the notorious Frederick Wheeler conducted punitive raids against local aboriginals. On 25 May 1872, Robert Travers Atkin, a Member of the Queensland Legislative Assembly, died at Sandgate following an illness of some months. At his request, At his request, he was buried in Sandgate on the crest of the rise on which he had enjoyed sitting under the shade of the trees and looking out onto Moreton Bay. His will provided £50 to build a church beside his grave. This church was the first St Margaret's church (now the rectory). A monument was erected to his memory by the members of the Hibernian Society of Queensland, of which he was vice-president. By 1874, coach services connected Sandgate to Brisbane. 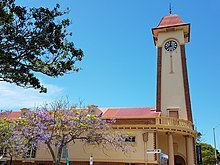 On 29 April 1880, Sandgate was proclaimed a municipality known as the Borough of Sandgate. The coming of the railway in 1882 promoted more rapid development of the Sandgate area. Travel to Brisbane by train could be completed in less than half an hour. The Local Authorities Act 1902 replaced all Divisions and Boroughs with Towns and Shires, creating the Town of Sandgate on 31 March 1903. This new status meant a town council was formed to guide the development of the local area. Initially, the council chambers were located in Shorncliffe. However, following a fire which destroyed the council chambers in 1910, a much larger town hall was opened in 1911. The Sandgate Town Hall was extensively renovated in 2011 to mark the 100th anniversary of the hall. The Sandgate Council, which operated from 1880 to 1925, had to provide a range of services for the growing community. These included a fire department, ambulance, and sanitation facilities, as well as maintaining roads and regulating local development. In October 1925 Sandgate Council was amalgamated into the City of Brisbane. As well as the town hall, Sandgate includes another historic landmark, which is the Sandgate Baptist church on the corner of Cliff Street and Flinders Parade. The church first opened in the late 19th century (1887) and has since undergone multiple restorations, yet has continued to remain in its original structure - although it is no longer operating as a church, being now utilised as a child care centre. Sandgate boasted clean beaches that were a popular weekend destination, with thousands of people visiting from Brisbane to escape the heat. Boating, swimming and golf were the most common sporting activities. Moora Park was the location for dances and open-air films. Sandgate Library opened in 1952 with a major refurbishment in 1996. Sandgate is also home to a community theatre group called Sandgate Theatre Incorporated, which has been performing in the Sandgate Town Hall continuously since 1958. The theatre group also hosts Brisbane's longest running community theatre festival, the Yarrageh festival, which is put on in August and September each year at the town hall. Most of Sandgate's facilities are located along Brighton Road, the main street in Sandgate, which include numerous banks, shops, services and a small shopping centre anchored by a Woolworths supermarket. Woolworths previously traded adjacent to the site of the centre until the opening of the new store in February 2009. The old Woolworths site has been redeveloped as an Aldi supermarket, opened in December 2013. The Sandgate railway station on the Shorncliffe line is a short walk from these facilities. Sandgate has two schools, the Sacred Heart Primary School and Sandgate State School, both of which are within walking distance of the railway station. The Brisbane City Council operates a public library at 1 Seymour Street. The Sandgate & District Historical Society & Museum is at 150 Rainbow Street in a building that was formerly Mohoupts’ General Store and a local funeral business. In 2009, the Sandgate Post Office was relocated to other premises and the heritage-listed building was sold. It was subsequently renovated and is now operating as the 4017 Bar & Grill (4017 being the postcode for Sandgate). Despite objection by some local members of the public, a McDonald's family restaurant opened opposite the 4017 Bar & Grill in 2014. Recreational facilities in Sandgate include numerous parks, walking and bike tracks, and a municipal swimming pool on Flinders Parade. The Sandgate Golf Club is located in Allpass Parade, Shorncliffe. A number of sports teams represent the local area, including the Sandgate-Redcliffe Gators and Sandgate Football Club. In 2005 Surf Connect Watersports Centre opened at 170 Flinders Parade. Other than kayak rentals, they introduced the sport of kitesurfing, windsurfing as well as standup paddling to the area. Sandgate is now a much more colourful and exciting village as a result of these water activities. There is a popular and well-equipped Police and Citizens Youth Club (PCYC) located next to playing fields at the western end of Kempster Street. It runs regular Blue Light Discos and other social events, and is a centre for gymnastics, martial arts training and other sports. Operating out of the PCYC is the Shorncliffe Pottery Club which started in nearby Shorncliffe over 30 years ago, and after some years at Sandgate Town Hall relocated to the PCYC. The club holds an annual exhibition named Expressions at Sandgate Town Hall each October, as well as participating with other local arts organisations, such as Sandgate Art Society (SasArt) and the Deagon-based Artrageous, in staging other art and culture events, including those which are part of the Bluewater Festival in the week before Easter each year. The Brisbane to Gladstone Yacht Race starts from Shorncliffe Pier every Easter. It is the highlight of the popular Bluewater Festival of arts and cultural events held throughout the district. ^ a b Australian Bureau of Statistics (27 June 2017). "Sandgate (QLD) State Suburb". 2016 Census QuickStats. Retrieved 25 March 2018. ^ "Deagon Ward". Brisbane City Council. Brisbane City Council. Archived from the original on 9 March 2017. Retrieved 12 March 2017. ^ a b Australian Bureau of Statistics (31 October 2012). "Sandgate (QLD) State Suburb". 2011 Census QuickStats. Retrieved 3 June 2013. ^ "North East Wetlands". Brisbane City Council. Retrieved 3 June 2013. ^ "Local History - Sandgate". ABC Radio Brisbane. Australian Broadcasting Corporation. 6 May 2009. Retrieved 14 April 2019. ^ Gregory, Helen; Dianne Mclay (2010). Building Brisbane's History: Structure, Sculptures, Stories and Secrets. Warriewood, New South Wales: Woodslane Press. ISBN 9781921606199. ^ "The Indigenous People - Sandgate Historical Society". www.sandgatemuseum.com.au. Archived from the original on 28 February 2016. Retrieved 15 January 2016. ^ a b Hogan, Janet (1982). Living History of Brisbane. Spring Hill, Queensland: Boolarong Publications. p. 91. ISBN 0-908175-41-8. ^ Petrie, C.C. (1904). Tom Petrie's Reminiscences of Early Queensland. Brisbane: Watson, Ferguson & Co.
^ "HISTORIC MONUMENT IN RECTORY GARDEN". The Courier-mail (1076). Queensland, Australia. 10 February 1937. p. 15. Retrieved 14 April 2019 – via National Library of Australia. ^ Mennell, Philip (1892). "Atkins, Robert Travers" . The Dictionary of Australasian Biography. London: Hutchinson & Co – via Wikisource. ^ a b Brisbane 150 Stories. Brisbane City Council Publication. 2009. pp. 118–119. ISBN 978-1-876091-60-6. ^ "Sandgate Municipality". Queensland Government Gazette. 1 May 1880. p. 26:1007. ^ a b "Agency ID9619, Sandgate Town Council". Queensland State Archives. Archived from the original on 8 August 2014. Retrieved 15 August 2013. ^ "Wednesday 2 June 1880". The Courier-Mail. National Library of Australia. 2 June 1880. Archived from the original on 6 December 2017. Retrieved 22 August 2008. ^ a b "Sandgate Post Office (entry 600290)". Queensland Heritage Register. Queensland Heritage Council. Retrieved 19 June 2013. ^ "Sandgate Town Hall (entry 601566)". Queensland Heritage Register. Queensland Heritage Council. Retrieved 19 June 2013. ^ "Sandgate Baptist Church (former) (entry 602424)". Queensland Heritage Register. Queensland Heritage Council. Retrieved 19 June 2013. ^ "Sandgate War Memorial Park (entry 602454)". Queensland Heritage Register. Queensland Heritage Council. Retrieved 19 June 2013. ^ "138 Flinders Parade, Sandgate (entry 601515)". Queensland Heritage Register. Queensland Heritage Council. Retrieved 19 June 2013. ^ "Aldi Opening Date Revealed". Archived from the original on 1 February 2014. Retrieved 24 January 2014. ^ "Sandgate & District Historical Society & Museum". Brisbane's Living Heritage Network. Archived from the original on 16 March 2018. Retrieved 16 March 2018. ^ "4017 Bar & Grill Sandgate". Archived from the original on 8 July 2012. Retrieved 11 June 2012. ^ "Contact Us". Sandgate Golf Club. Archived from the original on 23 October 2014. Retrieved 23 October 2014. Wikimedia Commons has media related to Sandgate, Queensland.